1. Removing DVD copy protection is important. A great many of users blame some free DVD ripper software for the failure to rip DVDs. Tech geeks may understand ripping movies on DVDs to H.265/HEVC or other some formats fall flat out of sheer copy protection systems encoded on these commercial DVDs, intended to stop DVD ripping software from copying the movies and TV series out of the physical format. These systems include CSS, Region Code, RCE, UOP, Sony ARccOS, Disney X-project DRM and more. So if a DVD ripper cannot remove copy protection from DVD, the DVD to HEVC conversion will led nowhere. 2. Hardware acceleration is a trump card. Converting a full-length DVD movie used to take as long as 30-60 minutes, this is time-wasting, especially when you have hundreds of DVD discs. Consequently, a fast DVD ripper is much sought after. The good news is that a few of these programs manage to support the hardware acceleration tech like Intel QSV and NVIDIA NVENC to speed up the process. This makes a full DVD rip as short as 10 minutes, such as MacX DVD Ripper Pro and Handbrake. First of all, HEVC/H.265 doubles the data compression ratio at the same level of video quality compared with H.264. This means it offers better image quality in the same size or reduces video file size by half at the same level of video quality. Generally, a full-length DVD movie comes in 4.7 GB single and 9.4 GB double-sided sizes, while by ripping DVD movies to HEVC/H.265, it greatly saves your hard drive space at a size of around 150MB. See more H.265 vs H.264 comparison. 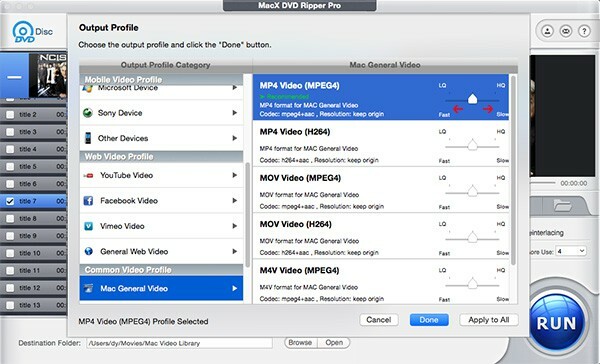 MacX DVD Ripper Pro - Fast rip any DVDs with CSS, Region Code, Sony ARccOS, X-project DRM, etc to HEVC, H.264, MP4, MOV, MKV, AVI, etc. Support hardware encoding tech to greatly accelerate the conversion. 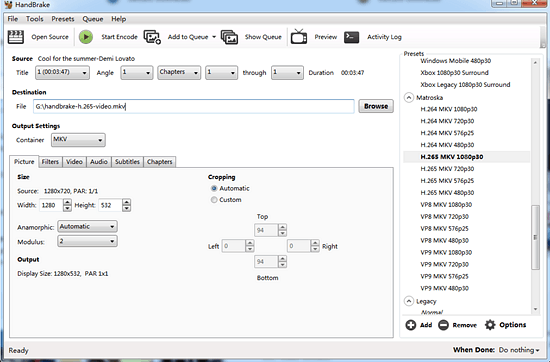 It's known to all Handbrake latest version incorporates HEVC codec into its support list, so it is the most recommended free DVD ripper software that can convert DVD to HEVC effortlessly. You can follow the Handbrake tutorial here. Step 1: go to Handbrake official page and download the latest version. Note: Handbrake cannot rip commercial DVD to HEVC, MP4, and MKV, unless you install libdvdcss on Mac or Windows. Follow the Handbrake libdvdcss tutorial and then begin the DVD ripping process. Step 2: After you fire off Handbrake, Click Open Source to load the DVD you want to convert. ISO image and DVD folder are also supported. Step 3: Click Browse button to save the converted HEVC file. Note: it's not suggested to choose the resolution higher than 576p since a DVD resolution is normally 480p and 576p. Video resolution in 720p or 1080p won't make it look better. For better compatibility with mobile devices, you can also go to the Output Settings > choose MP4 in the Container as the output format > got o Video tab > choose H.265 (x265) in the Video Codec. Handbrake can transcode DVD discs to HEVC smoothly, but this is only realized when the DVD is not copy protected. CSS and region code protected DVDs will be cracked only with the installation of libdvdcss. For other recently released DVDs or DVDs with multiple titles as many as 99, Handbrake will draw a blank. Luckily for you, the top-end MacX DVD Ripper Pro is your trustworthy lifesaver. It is updated constantly to support the latest DVD titles, new Disney DVDs like Zotopia, Moana, the Beauty and Beast, and more and successfully rip protected DVD to Mac, Windows hard drive, MP4, H.264, MPEG4, MOV, MKV, AVI, etc for your diversified needs. 300+ preset profiles are equipped for you to convert DVD to hard drive, NAS, iPhone (iPhone X/8), iPad, Samsung, Android, Apple TV, iTunes, YouTube, PS4, Chromecast, and more in one click. The best part is the DVD to HEVC converter takes full advantages of Intel QSV and NVIDIA NVENC hardware acceleration technology to dramatically enhance the DVD ripping speed. Generally, a full-length DVD movie will be converted to MP4 as short as 8 minutes. You can follow the steps below and convert DVD movies to H.265/HEVC on Mac and Windows. The download of the DVD to HEVC ripper is pretty easy. Just go to its official page and get a specific version according to your platform. It takes only 34mb disc space. Click DVD Disc button to load DVD. You can also convert ISO image or DVD folder as per your needs. The DVD ripping software will automatically scan the right title from the 98 fake ones. From the profile window, you can go to Mac General Profiles > and choose MP4 HEVC > and click Done. You will also at ease to convert DVD to iPhone X, iPad Pro, iMovie, Apple TV, Samsung Galaxy S8, etc at your disposal from the pop-up window. Click Browse to save the file in a new output folder if necessary. And tap RUN to begin the conversion from DVD to HEVC codec. Note: the hardware acceleration box is checked by default. If your computer is configured high enough with hardware encoding technology, the ripper will apply it and dramatically speedup the process. Best DVD to HEVC converter - MacX DVD Ripper Pro enables you to freely rip DVD, ISO image, DVD folder to MP4, H.264, MPEG4, MOV, MKV, WMV, AVI, FLV, etc with high quality and fast speed. Update constantly to rip any newly released DVDs with CSS, Region Code, Sony ARccOS, UOP, X-project, etc.